Opal is the traditional birthstone for October. 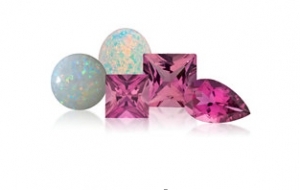 Pink tourmaline is the substitute for opal due to opal being such a soft stone. There is an old wives tale that if you were not born in the month of October, you should not wear opal because it is bad luck. I still have many clients come in and tell me this, and they live by it! Opals range in color from milky white to black with flashes of yellow, orange, green, red, and blue. An opal’s beauty is the product of contrast between its color play and its background. Tourmaline has become a favorite gemstone among jewelry designer, and gem collectors the world over. Since it is available in a wide variety of colors, it is ideally suited to almost anyone’s taste. Tourmaline also is known for displaying several colors in the same gemstone.